Ancestor Face, lower Sepik River, New Guinea. 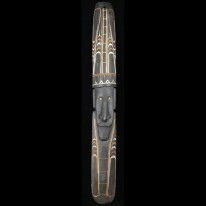 A small ancestor face like this would have been kept in a person’s house to help protect his or her relatives. The mask itself is 9.5 inches tall.